LEN - www.lankaenews.com | ‘Sometimes I feel like taking Ranil to the top of a huge mountain and kill him by pushing him down’ says president ! This was told shamelessly and brazenly on 11 th evening by Pallewatte Gamralalage Maithripala Yapa Sirisena , a father with a family who did not hesitate to ruthlessly liquidate two fiances of his younger daughter . The president made this remark when he was having discussions most secretly at his official residence after inviting three individuals supposedly most close to him. The three individuals were , his co ordinating secretary Shiral Lakthileke , chairman of Foundation Institute Sarath Kohongahage and presidential media director Vasanthapriya Ramanayake . Interestingly it is this same president who earlier on hatched a conspiracy too against the prime minister making use of Namal Kumara who is working in his own presidential secretariat receiving salary from the secretariat . After enacting the ‘conspiracy to murder president’ fake drama , and when he tried to get the P.M. arrested thereby , the IGP had refused to co operate . Consequently the conspiracy flopped. Now , based on the abominable utterance made by the president during his secret discussion , it is very clear what amount of venom and vengeance Sirisena alias Sillysena is having against the P.M. When such a statement of hatred escaped from the mouth of the president the other three individuals present looked with their mouths and eyes wide open in deep shock because they knew how indefatigably and sincerely Ranil worked to make ungrateful uncouth Sirisena the president of the country. Later ,Shiral, Kongahage and Vasanthapriya who met at another venue following president’s discussion had resented president’s statement. The three of them have concurred , no matter what , the president making such an obnoxious statement is wrong against a prime minister who was responsible to put him on the presidential pedestal . 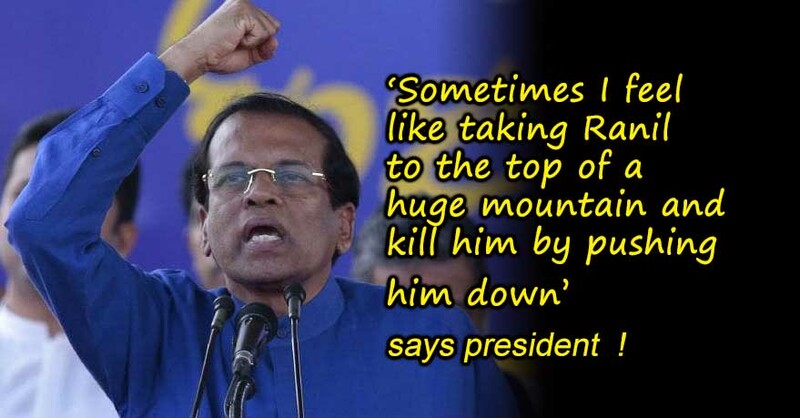 Besides, when Rajapakses were threatening to send Sirisena six feet underground , and he was in mortal fear for his life , even frightened to address the last election rally , it was the P.M. who again encouraged and led him on to make him the president, they have pinpointed. They have further discussed , if president Sirisena is able to forget all the good deeds done by Ranil this easily and treat the latter this way who even faced the dire situation that night on his behalf when Sirisena was hiding in a Kurunegala coconut estate harboring fears about the election results , what amount of malice and aspersions would n’t such an ungrateful leader direct against them? They have asked among themselves.